HANG TIGHT | Pro Chem, Inc. HANG TIGHT is the key to toilet bowl freshening. It is easy to use and clips on the outside of most standard toilet bowls. The clip is discreet and locked into place when the seat is in the downright position. Works great on the outside of the toilet bowl, on the side of the tank, or top partition. The product shrinks to fit as fragrance evaporates. It is made from a unique, patent-pending material that contains 30 times more air freshener than the standard toilet bowl rim sticks. 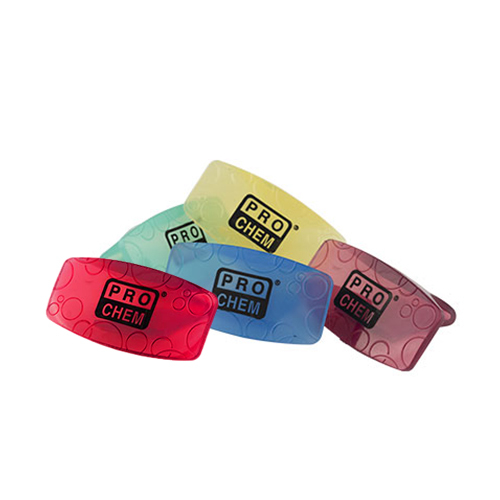 Clip on the outside of a toilet bowl or anywhere else odor control is desired.